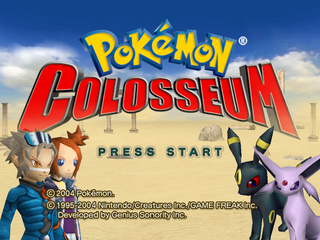 Pokémon Colosseum is a weird combination of Final Fantasy and Pokémon. GOTTA SAVE 'EM ALL, MAN! Fix this article. 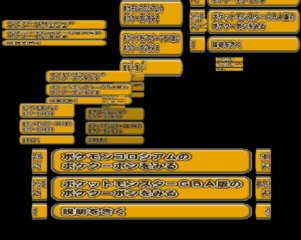 Also, there's supposedly a ton of unused text, plus Japan-only e-Reader content, and much more. This might be different in the European version. There also is a debug_menu.fsys file in the ISO, investigate this. With the code activated, pressing D-Pad Up will show or hide a bar that has Japanese instructions on how to use the debug function. Pressing the L button will cycle between pause (instant stop), slow (low frame rate), and play (regular speed). Pressing R will pause the game, like when pressing L sometimes, but is more accessible and doesn't need to be cycled to. Kecleon, Minun, Spoink, Baltoy, Castform, Psyduck, Teddiursa, Wobbuffet, Wailmer, Porygon2, Xatu and Whiscash cannot be obtained as Shadow Pokémon. Baltoy, Teddiursa, Magcargo, and (technically) Psyduck and Xatu, however were introduced as Shadow Pokémon in the sequel Pokémon XD: Gale of Darkness. Hi, it's NETT. I analyzed the SHADOW POKéMON LIST again and discovered six more. The additions are SKIPLOOM, QUAGSIRE, SUNFLORA, FURRET, MAGCARGO, AND MINUN.. I'll send another update if I can find any more. A dialogue string, meant to be said by the girl ("Eh!? Chimecho isn't a Grass Pokémon... It's a Psychic Pokémon. "), might be related to the Shadow Grass Pokémon King. Get a picture of its model. 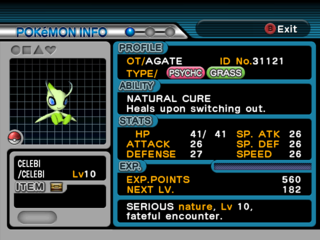 For the sake of consistency, every Pokémon in every Pokémon game is given a Shiny variant, and Celebi is no exception. However, because the only way to obtain it legitimately was through distributions, the Shiny version of Celebi was left unobtainable through normal means. 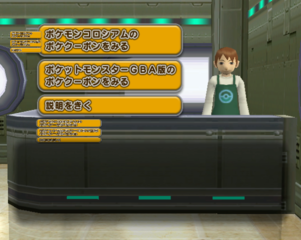 Although the e-Reader content was removed from the international versions, the theme used for the menu screens, "virtual", can still be found on the disc. A workaround to obtain the e-Reader Pokémon in the European version. Be more specific about which dialogue is missing in the European version. 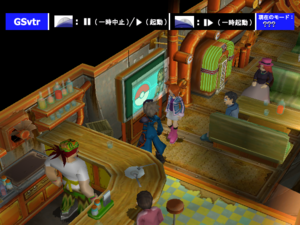 After completing the main story in the Japanese version, players could access the "Card e room" via the left door in the Phenac Stadium lobby, where they could battle VR Trainers by scanning Battle e cards. 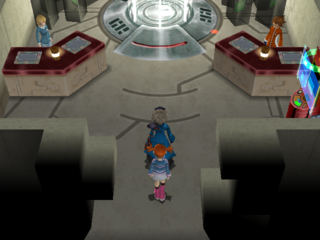 In international versions, both doors in the lobby lead to the battle area, though the Card e room is still seen in the demo that plays after waiting on the title screen. However, the Card e room is present yet inaccessible in international versions. There are translation mistakes like not capitalizing the first letter in the game's name. The word e-Reader uses a different letter "e" not seen elsewhere. 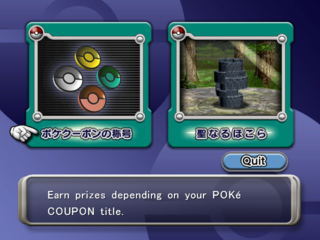 If you have gained access to the Card e room in the US version, you are able to use a Japanese e-Reader and e-Reader cards to battle VR Trainers. As the e-Reader itself is Japanese, all text on the e-Reader will be displayed in Japanese. You can not use an English e-Reader, and English e-Reader cards were never made available. 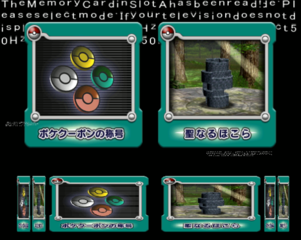 Translation is nearly complete, with Japanese text still being displayed for the name of e-Reader cards that change the stadium, for the difficulties, and for the title card in the top left of the menu. In order to gain access to battles, you must load a program from the game onto the e-Reader. This program must be loaded from the US version, trying to use the program loaded from the Japanese version will not work. In the European version, the game is unable to connect to the e-Reader. The Card e room's NPC dialogue is missing, and they will only display empty text boxes when interacted with. To enter it, visit the basement of the Phenac City Pokémon Center with this Action Replay code. In the Game Boy Advance multiboot file sent from the WISHMKR Colosseum Bonus Disc, support for FireRed and LeafGreen (as well as Japanese versions for all games) is actually present and fully working. However, support for these games, either intentionally or by accident, is disabled by default. Internally, the function which checks the inserted game's ID will return a bitmask depending on which game is inserted. Bit 0 is set if the game is non-Japanese. Bit 1 is set when an out of region game is inserted. Bit 4 is set for Ruby or Sapphire, and Bit 5 is set for FireRed or LeafGreen. When returned value is checked, however, it will check to make sure bit 0 is set, and then bit 4 must be set as well. 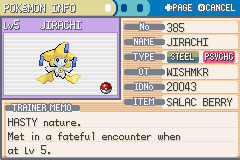 By dumping the multiboot file, decompressing the main code, and then nopping out 020134CC (to allow Japanese games) and 020134D4 (to allow FireRed/LeafGreen), the WISHMKR Jirachi can be transferred to all US and Japanese Pokémon games except Emerald. Support for Emerald is seemingly missing, however it was also released much later than Colosseum. One of the menu options is glitched in the European version. 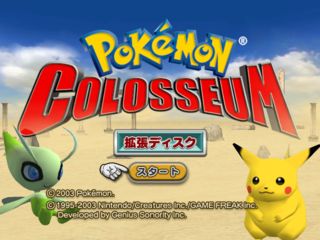 Content from the Japanese bonus disc (such as the Celebi event) was left in the full game. 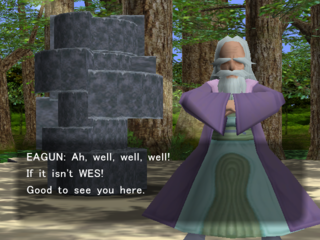 In the US version, its translation is incomplete as various graphics remain Japanese. 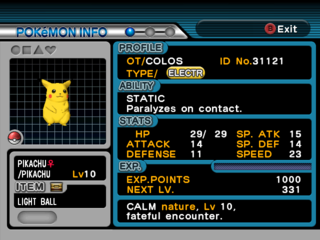 "LIGHT BALL" is misspelled "LIGHTBULB" when receiving the event Pikachu. The European version is considerably buggier. Its additional issues include missing text and corrupt graphics. This Action Replay code will make it appear upon starting the game. The Relic Stone map in Agate Village is listed internally as "shrine_1F", even though it does not use multiple floors. Single-floor maps do not use this notation, which may suggest additional floors were once planned. "cerebi_dat" in ex_shrine.fsys (used for the Relic Stone) is included in the main game disk, even though it is only used in the Japan bonus disk. The e-Reader content is present on the North American disc, including an unreleased 21st card. Try to force-load this content. Compare the girl's character model. The story mode character's partner has a longer skirt and shirt outside Japan. The English title logo was changed to remove the Japanese version's brick wall look, and consequently its rising from the ground animation. Oddly enough, an earlier version of the logo (with the brick background) was used for the cover artwork of the US bonus disc. Three Shadow Pokémon are unobtainable by normal means due to the e-Reader room (see above) being dropped from the international versions. 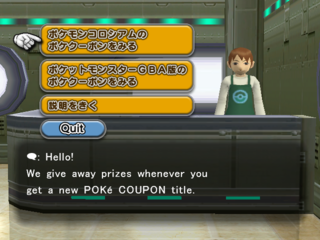 By completing a VR trainer difficulty, the player would be challenged by a real trainer in the e-Reader Room with a Shadow Pokémon. There's one trainer for completing each difficulty, and the Shadow Pokémon that were obtainable were Togepi, Mareep, and Scizor. Interestingly, Togepi and Mareep have evolved forms already in the regular game as Shadow Pokémon and they were used as Shadow Pokémon in Pokémon XD: Gale of Darkness. This page was last modified on 25 January 2019, at 02:18.